Not all tickets are the same - your customers have different reasons for getting in touch with you. As such, not all Zendesk Support tickets work the same way. A ticket can be one of four types: a Question , a Problem , an Incident , and a Task . Each of these types allows you to do different things with the ticket based on the issue at hand. A Question is the most straightforward - a customer has a question and you try and resolve it. But what about if one of your customers writes in about a problem they are having with your service? Like, for instance, you run an online store and the billing part is not working. In this case you'll want to take advantage of Problem and Incident tickets. The benefit of this goes beyond the naming. 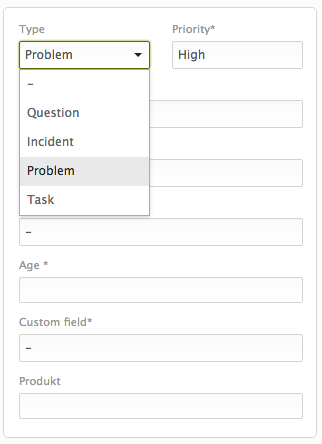 In Zendesk Support Problems and Incidents are related; specifically a Problem can have many Incidents attached to it. Let me show you how it works. First a ticket comes in alerting me that one customer is having trouble checking out of my store. I verify that indeed, the credit card authorization is not working. This is not a question about the billing - something is indeed broken. I classify the ticket as a problem by changing it's type and let the customer know we are working on it. Up to now it's worked like a standard question ticket. It's when I get another ticket mentioning the same problem that the Problem/Incident relationship becomes more important. A second customer writes in about not being able to check-out of my store with the subject 'Store Not Working!'. In this case, I classify the new ticket as an incident . This ticket is an incident of a problem I already know about. When I do that, a second drop down opens up asking me to "Link incident to problem". I link it to the previous ticket that came in. I can keep doing this as more related incidents come in. This way, I'm keeping all the tickets related to my billing issue linked together. 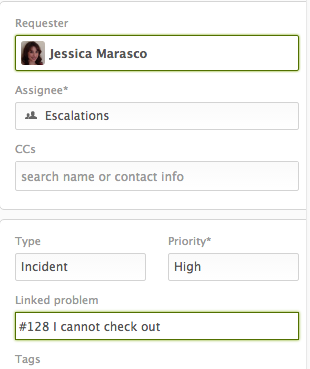 When I go back to the original problem ticket, at the top of the ticket window there is an Incidents tab. When I click on this tab, I can see a list of all of the incident tickets relating to my Problem ticket. When I figure out and fix the issue with my billing, I can mark the problem ticket as solved. But it's not just the problem that gets solved - it's also all the incidents. Solving a problem ticket will also automatically solve and add any comment you included while solving to all the related incidents. Leveraging Problems and Incidents can help you organize and streamline your support process when problems arise. You've already got to deal with the problem; you should make your support of the problem as easy for you as possible. Very handy but how do multiple support users recognise open incidents (I assume a view?) or that first incident association to the problem? What is the best practice here? Tags? is it possible to create a view that lists the problems and indicates the number of linked incidents to each problem? There is not a direct way to list all these tickets in one view. What you can create is a view that lists all the Problem ticket by applying the ticket type condition, and from there on, when you look at the problem ticket you would see all the linked incident tickets attached to this problem ticket. I was trying to figure out a way to get to a result using tags but nothing is going to be working as well as the ticket type condition. It would just involve some manual digging once you are in a problem ticket to see which tickets are associated to it. I hope this makes sense to you and would work. If you have a more specific question related to your account, feel free to send us an email at support@zendesk.com. Which feature are you asking about, specifically? Problem and Incident tickets are not new; they've been around since 2013. Are you referring to a specific function within the article? no no. the standard functionality is what i was referring to. it's fine, i had to make some adjustments to our internal user guide, but it's good that i caught this one. apparently Linked Tickets app can only link one to one tickets but it can link any of them, even Task and Question tickets. We require follow up with some of our callers on incidents prior to solving the ticket. Is there a way to not auto close all the related incidents on a problem ticket? We would like to add a custom field or something else that will help flag the incidents that should NOT be closed and a follow up is required. It sounds like you want to solve some of those Incidents but not all of them, right? There isn't a way to only solve certain Incidents when you solve a Problem. I think the easiest way to manage this would be to remove those Incidents that need followup from the Problem before you solve it. You could just leave them as individual tickets, or you could associate them with a new Problem made specifically for followup. Do you think that would work? Is there a way to link tickets in Support?